Angled spaces on Second? Don’t count on quick change. Don’t hold your breath for angled parking to come to the streets of downtown Albany. As I reported at the time, the idea got a fleeting mention during a meeting of the downtown urban renewal advisory committee on June 9. But that’s about all so far. As near as I can tell, neither the city council nor the Central Albany Revitalization Area board, which includes the council and seven others, has required anyone to do anything specific about angled parking. The topic of downtown parking comes up because Novak’s, the famous restaurant, is rebuilding an old storefront at 208 Second and plans to move there this summer. Unlike its present home off 14th Avenue, the new site has no parking lot, and customers will have to park on Second and nearby streets. Irish said other businesses also have expressed parking concerns. “They have asked (or are in the process of asking – I’m not following this closely enough to know) that CARA consider whether or not the streetscape plan being done for Second (Washington to Ellsworth) include angled parking on one side by using a design similar to what’s currently planned for around the post office,” Irish wrote. Irish sees a number of possible effects of angled parking on one side of Second. Among them: There would be an increase of 22 spaces in the three blocks between Washington and Ellsworth streets. But the speed on Second would be drastically reduced, perhaps to 10 mph or less, and a travel lane would be lost. Angled parking would raise the cost of sidewalk improvements because of changes in curbs and drainage. The front end of cars would hang over the curb, so there would be less space for benches or street lights. Also, more congestion (cars backing into traffic when leaving), and problems for bicyclists as the bike lane would likely disappear. There is, as Irish mentioned, a plan to install diagonal parking on the streets around the downtown Albany Post Office, but that plan is tied to the expansion of the Albany Carousel building, and the timing is uncertain. I wish Novak’s had thought more about the parking problem before they decided to move downtown. It will be hard for a lot of older customers of Novak’s to walk a great distance in order to eat there. I don’t think there is a parking problem downtown. I visit downtown frequently, and while I do have to park ‘around the corner’ often, rather than directly in front of a business, it’s really not a problem. The thing is: a lot of people either don’t know how to parallel park or dislike it so much they avoid any business where they have to do so. There’s a reason all the shopping centers and malls are almost exclusively diagonal parking. Draw your own conclusions about how much business downtown Albany loses because of it. When CARA first started there was a lot of talk about a parking structure. The problem, of course, are the very high costs involved. At some point in the future the people of Albany will undoubtedly have to deal with the issue. On the other side of the coin, it’s the clear success of the redevelopment that brings this issue forward. Shawn is right that for most people the short walks involved are not a problem. And Mary is right that for older folks it’s more of a problem. So here’s a couple of suggestions. Businesses that are primarily daytime, such as City Hall, County Offices, Wells Fargo, the Post Office and others post signs that say “Nighttime Parking Welcome in Downtown Albany” just to make sure people know they can use those spaces. A few more directional signs to available lots might also help. And maybe Ron Irish, one of the best employees the City has ever had, could think about whether some time specific handicap spots such as “Handicapped Parking 5pm to 7pm” could help out those seniors if there is a need to accommodate their access. No. Not at all, but suggestions from Bob Woods are a step in the right direction, We’re making progress……Yes? Ron Irish may, or may not be, “one of the best employees the City has ever had.” I don’t know Ron Irish from Adam and Eve except that I’ve seen his name many times over the years. But I’m headed for Corvallis soon, and I’m going to measure the width of Second St. there.vs the width of Second St. in Albany….to the INCH. And then I will tell you what I think of Mr. Irish’s opinion of angled parking in Albany. AND…….10 MPH? PUHLEEZE! I can jog that fast, WITH heart disease! In Corvallis, 2nd St., where there is angled parking on both sides of the street…..is 10 feet wider than 2nd St. in Albany. 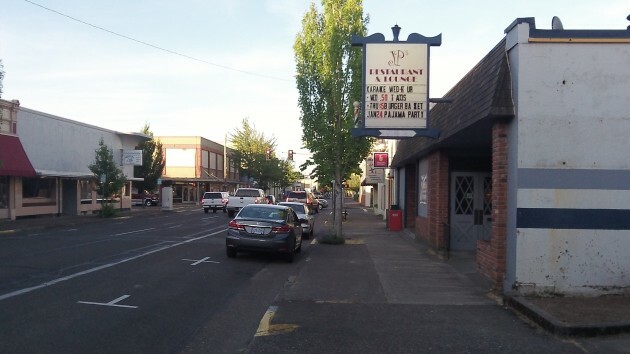 However, Albany provides a 4 foot wide bike lane whereas Corvallis simply designates the right lane as a bike lane along with being an auto lane. The posted speed on 2nd in Corvallis is 20mph.